The champurrado is one of the most characteristic drinks of the Prehispanic Mexico . It is a chocolate atole that leaves anyone amazed. The atole is of Mexica origin and it basically consists of a mixture of maize with water, that is served hot. In Prehispanic times it was used as a sacred beverage in rituals and ceremonies. We really don’t know where does the word “champurrado" comes from or why it was assigned to the chocolate atole the word champurrado. What we do know is that the word “champurrar" is of Spanish origin and it means mixture of liquors . Possibly the Spaniards named that way the chocolate atole because many interesting ingredients are mixed. What is very appetizing about the champurrado is that it is a sweet and thick drink; such consistency is obtained by using corn flour – indispensable ingredient of the atole. This drink is very typical from the state of Oaxaca, where it is served hot and accompanied of the famous tamales. Making the champurrado is easy but a bit laborious. We recommend that the chocolate tablet, that is used to make the champurrado, is of the brand Abuelita or Ibarra. Although the champurrado thickens with maize flour you could also use 4.4 oz of maize dough. The champurrado is sweetened with piloncillo, although if you don’t have 3.5 oz of brown sugar could also be used. It takes approximately 15 minutes to prepare the champurrado. Recipe for 1 qt of champurrado. 1/2 cup of Maize Flour. 1 cup of Cold Water (8.4 fl oz). Stir the bowl ingredients with a spoon, until having an homogeneous mixture without lumps. If the mixture is prepared with corn dough, you will have to dissolve it by using your hands. Strain the bowl mixture over another bowl, then set aside. Bring to a boil over high heat the milk that was put in the saucepan. When the milk boils reduce to low heat and cook the saucepan ingredients for about 4 minutes, until the chocolate and the piloncillos have dissolved; stir constantly. Incorporate in the saucepan the dough that was prepared, stir constantly. Cook the champurrado for about 10 minutes, until the dough is well cooked and the champurrado has a thick consistency; stir constantly. When the cooking is done discard the cinnamon branch. At the end the champurrado can be stirred with a molinillo and you will get a very foamy champurrado. 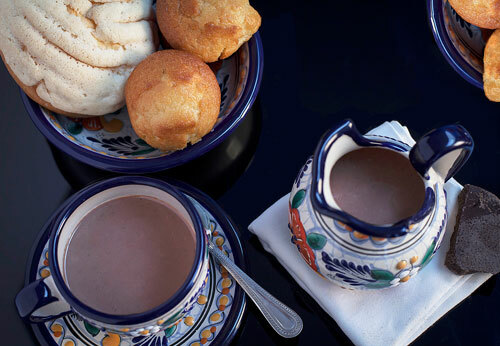 Suggestion: Serve the champurrado in clay cups so it look fabulous. Recommendation: If you want to try another hot and sweet drink, prepare the spiced coffee. Did you like the Champurrado? This chocolate will give an exquisite flavor to your champurrado. The “Maseca Corn Flour" will give to the atole the best taste and the best thick consistency. When piloncillo is used as sweetener the flavor of your food becomes more Mexican.